These fish come with backbones removed, and so can be eaten whole. Can be cooked using a wide variety of methods, including grilling, stewing, or frying. Each package is 140g (2 fish) and arrives frozen. This Pacific saury with fat is a completely new product: It is caught in the open sea near Hokkaido, its head and organs are removed without opening the belly, and then its backbone is removed. This means if cooked and eaten whole, all that will be left over is the tail! 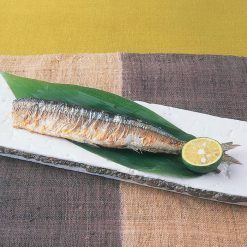 This Pacific saury can be eaten with peace of mind by anyone from children to elders. Sugarlady’s seafood is caught in season and processed right away, ensuring that you always receive the highest possible freshness and flavor. 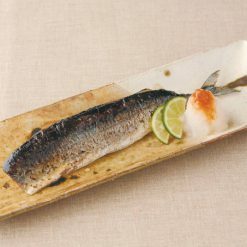 Because this Pacific saury comes deboned and ready to use, the amount of time you need to set aside for preparing fish dishes can be drastically reduced. In addition, because the fish comes frozen, it is easy to have plenty of it on hand at any time without worrying about it spoiling. Sugarlady’s seafood and other frozen products allow you to cook meals from all sorts of real, nutritious ingredients whenever you desire, even on the busiest of days! How to defrost: Simply defrost in the refrigerator. To defrost more quickly, place the fish (still in its bag) beneath running water (about 20 minutes).How to eat: Be sure to cook with heat before eating. Can be grilled, stewed, or fried, and flavored with your favorite sauces and seasonings.Small bones and the backbone have been removed, but infrequently small bones may remain in the fish; so please eat with care. The tail will contain bones. This product contains pacific saury (open sea near Hokkaido).. 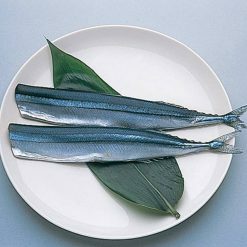 Origin of ingredients: Pacific saury (open sea near Hokkaido). Prepared and packaged in Japan.